D-dependent R polymerase catalyzes the transcription of D into R using the four ribonucleoside triphosphates as substrates. 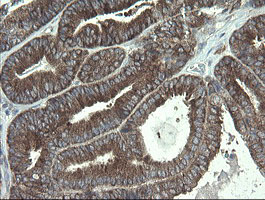 POLR3C is a specific core component of R polymerase III which synthesizes small Rs, such as 5S rR and tRs. POLR3C may direct with other members of the subcomplex R Pol III binding to the TFIIIB-D complex via the interactions between TFIIIB and POLR3F. POLR3C may be involved either in the recruitment and stabilization of the subcomplex within R polymerase III, or in stimulating catalytic functions of other subunits during initiation. 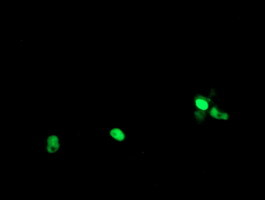 POLR3C plays a key role in sensing and limiting infection by intracellular bacteria and D viruses.POLR3C acts as nuclear and cytosolic D sensor involved in inte immune response. 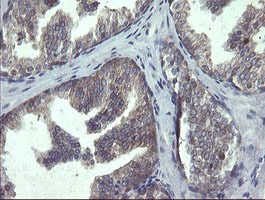 POLR3C can sense non-self dsD that serves as template for transcription into dsR. 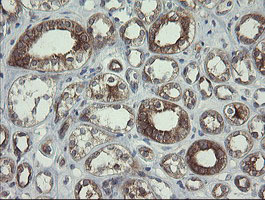 The non-self R polymerase III transcripts, such as Epstein-Barr virus-encoded Rs (EBERs) induce type I interferon and NF- Kappa-B through the RIG-I pathway. 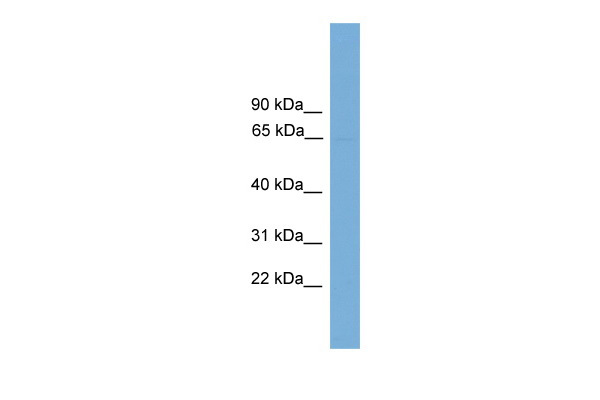 Western Blot analysis of POLR3C expression in transfected 293T cell line (H00010623-T01) by POLR3C MaxPab polyclonal antibody.Lane 1: POLR3C transfected lysate(58.74 KDa).Lane 2: Non-transfected lysate. 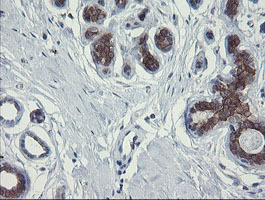 POLR3C MaxPab polyclonal antibody. 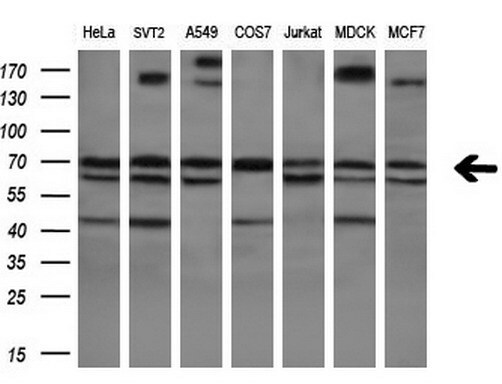 Western Blot analysis of POLR3C expression in Hela NE. 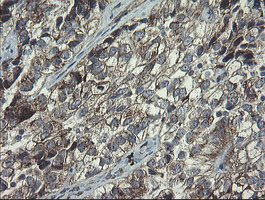 POLR3C MaxPab polyclonal antibody. 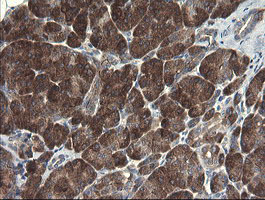 Western Blot analysis of POLR3C expression in human placenta. 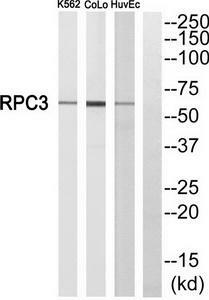 Western Blot analysis of POLR3C expression in transfected 293T cell line (H00010623-T03) by POLR3C MaxPab polyclonal antibody.Lane 1: POLR3C transfected lysate(58.74 KDa).Lane 2: Non-transfected lysate. 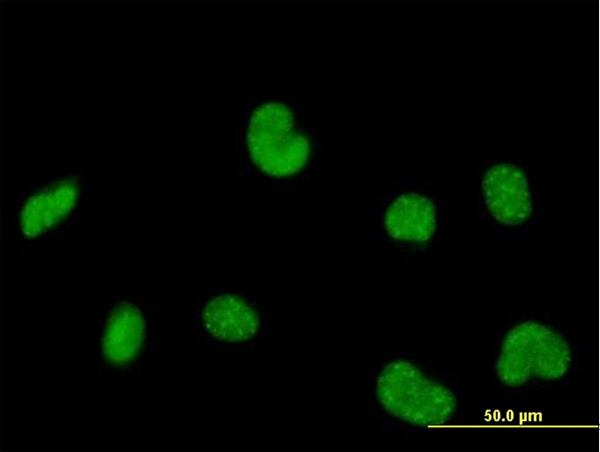 Western blot analysis of POLR3C expression in HeLa (A) whole cell lysates. 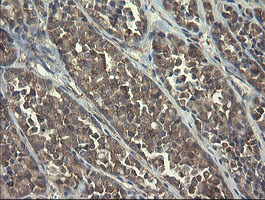 Anti-POLR3C mouse monoclonal antibody (TA505106) immunofluorescent staining of COS7 cells transiently transfected by pCMV6-ENTRY POLR3C(RC200279). 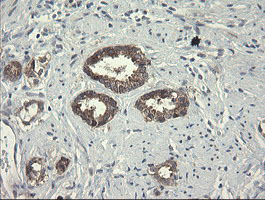 HEK293T cells were transfected with the pCMV6-ENTRY control (Left lane) or pCMV6-ENTRY POLR3C (RC200279, Right lane) cDNA for 48 hrs and lysed. 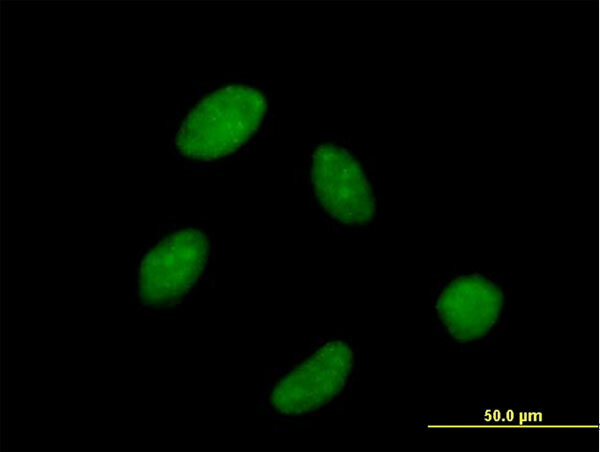 Equivalent amounts of cell lysates (5 ug per lane) were separated by SDS-PAGE and immunoblotted with anti-POLR3C. 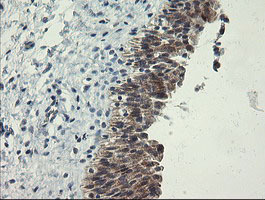 Western blot analysis of extracts from K562 cells, CoLo205 cells and HuvEc cells, using RPC3 antibody.The lane on the right is treated with the synthesized peptide.